Andrews McMeel Publishing, 9781449450885, 400pp. 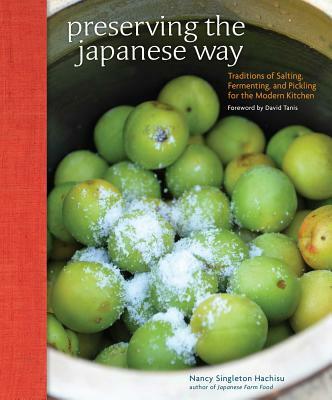 Preserving the Japanese Way, nominated for a 2016 James Beard Award in the International Cookbook category, introduces Japanese methods of salting, pickling, and fermenting that are approachable and easy to integrate into a Western cooking repertoire. Documentary-quality photo essays reveal the local Japanese communities that support these long-established preservation practices. It is by Nancy Singleton Hachisu, author of Japanese Farm Food. Preserving the Japanese Way: Traditions of Salting, Fermenting, and Pickling for the Modern Kitchen offers a clear road map for preserving fruits, vegetables, and fish through a nonscientific, farm- or fisherman-centric approach. An essential backdrop to the 125 recipes outlined in this book are the producers and the artisanal products used to make these salted and fermented foods. The more than 350 arresting photos of the barrel maker, fish sauce producer, artisanal vinegar company, 200 hundred-year-old sake producer, and traditional morning pickle markets with local grandmas still selling their wares document an authentic view of the inner circle of Japanese life. Recipe methods range from the ultratraditional— Umeboshi (Salted Sour Plums), Takuan (Half-Dried Daikon Pickled in Rice Bran), and Hakusai (Fermented Napa Cabbage)— to the modern: Zucchini Pickled in Shoyu Koji, Turnips Pickled with Sour Plums, and Small Melons in Sake Lees. Preserving the Japanese Way also introduces and demystifies one of the most fascinating ingredients to hit the food scene in a decade: koji. Koji is neither new nor unusual in the landscape of Japan fermentation, but it has become a cult favorite for quick pickling or marinades. Preserving the Japanese Way is a book about community, seasonality as the root of preserved food, and ultimately about why both are relevant in our lives today. Native Californian Nancy Singleton Hachisu has lived with her Japanese farmer husband and three sons in their traditional Japanese farmhouse for the last 27 years in rural Japan, where she served as leader of a local Slow Food convivium for more than a decade. Her first book, Japanese Farm Food (Andrews McMeel, September 2012), was praised in the New York Times, London Times, the LA Times and more. TBS and Fuji TV are currently documenting Hachisu's preserving and farm food life in rural Saitama as well as her visits to artisanal producers in more remote areas of Japan.